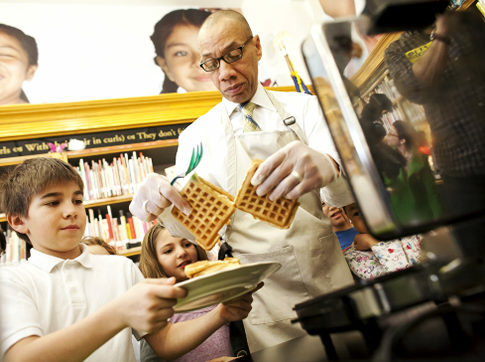 Hi, it's me, your old buddy Dennis "Waffles" Walcott. I've just made a tough statement about teachers, because Mayor Bloomberg thinks the way to support our hard-working staff is to let them know we're working on new ways to fire them, and I agree completely. From now on, get two U-ratings and we'll try to remove you from your job, whether or not your principal thinks it's a good idea. This may be tough, since some of our principals give U-ratings for arbitrary and frivolous reasons, but I don't care about any of that. It's true that right now the burden of proof is on us, and we're likely to waste a great deal of city money going after teachers who haven't actually done anything wrong. However, I'm certain the NY Post will not see it that way, and will gleefully do stories on the perfidy of these teachers even after they're acquitted. So for me, it's kind of a win-win. Of course, once we get that new evaluation system up, we figure the burden will be on the teachers and we can pretty much fire whomever we want. Of course, the agreement now states that 13% of poorly-rated teachers can get a fair hearing, and we're holding out until we can negotiate that number to a more reasonable 0%, which the mayor prefers, and I support completely. You see, Mayor Bloomberg thinks the best way to encourage teachers is to not give them a raise for four years, and also to deny them the contract we granted all other city workers for the 2008-2010 round of pattern bargaining. I agree completely. A few days ago, the Mayor decided teachers would feel even more supported if they were denied a retroactive raise to catch up. You see, that way, we can wipe out at least 8% of the "raises" we're always boasting about, and actually lower teacher pay. Mayor Bloomberg thinks this will encourage teachers to support him, and I agree completely. We're also looking at trying to fire the ATRs, but now we're thinking about a buyout. Maybe if we wave enough money at them they'll just go away without a fight. You see, our "fair student funding" plan makes principals pay the full salaries of teachers, so principals just don't want to hire some highly-paid experienced teacher when they can grab two newbies for the same price. Mayor Bloomberg thinks that's a great idea, and I support him completely. So what we're looking at, especially with closing 24 schools for no special reason, which I support completely, is trying to make this job so insecure, threatening, and frustrating that teachers will walk out en masse. Then we can hire newbies to replaces them, turn them over every two or three years, and no one collects a big salary but consultants and those of us working at Tweed, which I support completely. Hopefully, no teacher sticks around long enough to collect some nasty pension--another win-win. So thanks, teachers, for all your hard work. Mayor Bloomberg and I will be happy to give you a hearty handclasp along with your pink slip.